It's June already! Can you believe it? June brings summertime activities and lots of sunshine and warm days! Which brings me to my project for the day. Just the other day my son was outside trying to teach my golden retriever the "retrieving" part of fetch. You would think it comes naturally, right? Nope... she wants to fetch it, then have you chase her to get it back. I caught this shot of him patiently working with her "Drop it" command. I knew it was the perfect photo for my summer fun layout. 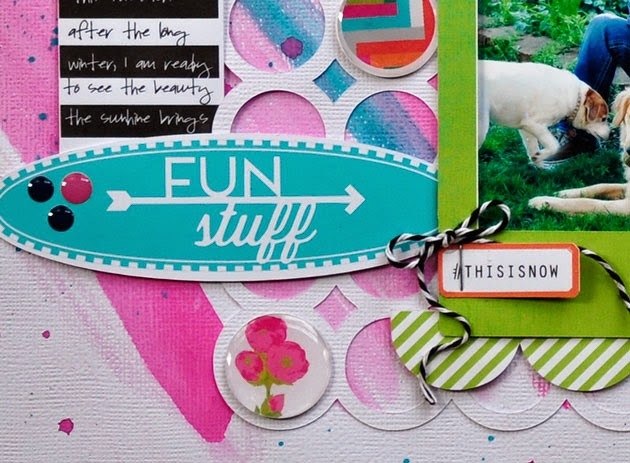 The Epiphany Crafts Shape Studio Round 25 was just what I needed to add some flair buttons to my layout. You can see above I added five flair buttons. I also used the newly released Heidi Swapp Digital Collection called "favorite things". Even though it's digital, I printed and cut all of the elements out using my Silhouette Cameo to create a hybrid layout. I have the actual products, but being the hoarder I am, I just can't bear to use them... what if I run out?!!?! Begin with a blank 12 x 12 paper in white. Add watercolors to match your papers. 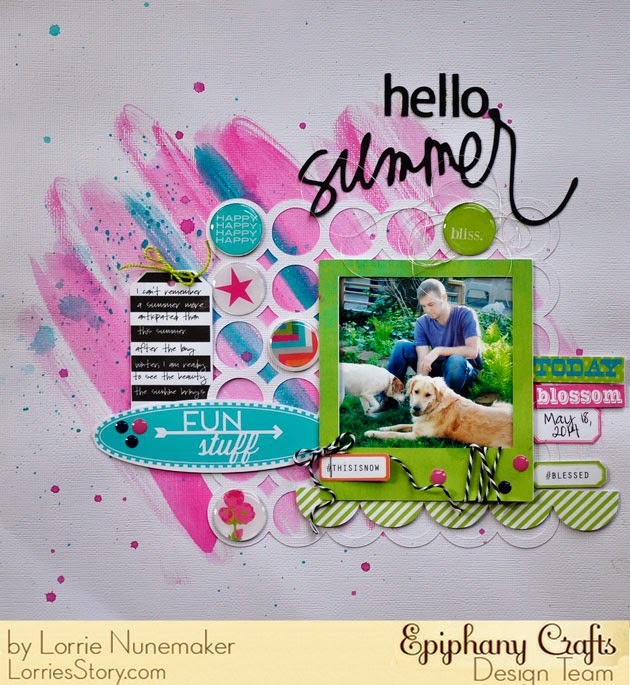 Using a die cut machine cut a circled background sized so that the circles are approximately 1". 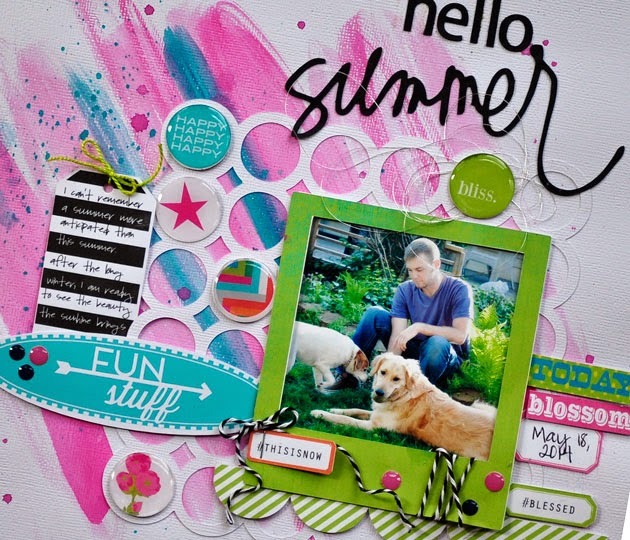 Begin layering embellishments and photos. 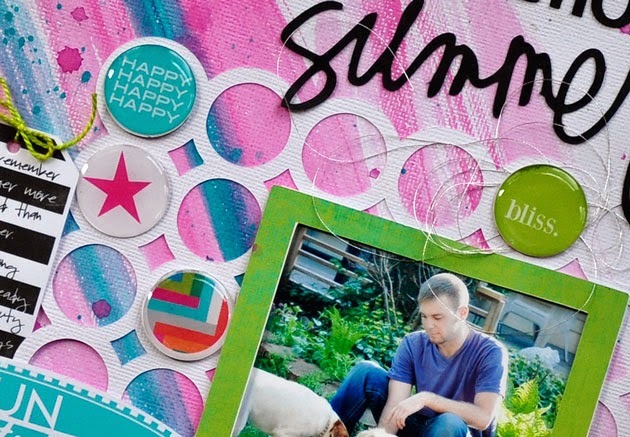 Using the Shape Studio Round 25 tool and bubblecaps make several flair buttons to coordinate. Place them randomly in the circle background. Add your title and you're finished.